It’s a little difficult to fathom why the thought of planting my fall garden this week causes my spirit to spiral into paroxysms of delight. After all, my garden now is so full of lovely things to eat that I can’t keep up with it. Or with the lovely things, themselves: heirloom tomatoes, roma beans, basil, onions, peppers, and the like, to name just a few. The melons, happily, are finally setting on: Orangeglo watermelon (the best watermelon I’ve found), Moon and Stars, of course, and Boule d’Or melon. There are still a few weeds to pull, too, for when we have a slow day (hahahaa “slow day”). Oh my. The weeds. The other day, little Mack came out to find me in the garden, pulling up foxtail and lambs’ quarters and grasses by the armload, and he regarded me sadly. “Mom,” he said in his too-wise-for-his-years manner. “There is absolutely no way you’ll pull all these weeds. Best to ask Dad to bring the rototiller out and just ’till the whole thing under.” Tsk, tsk. But not me. No hammock or little glass-topped table or nuthin’. Nor a refreshing bevvie. Just weeds, weeds, just more . . . detestable . . . weeds. But! I do not indulge in self-pity, Gentle Reader. No. And actually, it does feel quite good to have so much fresh mulch readily available (the freshly-pulled weeds). I just heap them everywhere. Ironically, they keep more weeds from coming up, because I have so many of them to heap about. “Smothering mulch” perhaps could be a new garden term, for those of us with August gardens that we are loathe to just “’till the whole thing under.” I have also been pushing wheelbarrow loads of them to the chicken yard, and it does a body good (wouldn’t you agree?) to do something so healthy for one’s chickens as putting mountains of weeds (some of them already going to seed!) into their yard. They pick and eat and scratch and grin. So there’s that. Today, not tomorrow, not on the weekend, but today I’ve got to can another batch of tomatoes, since the ones that the kids and I have been picking and that I’ve been arranging on the tables out on the back porch are starting to smell a bit . . . suspicious. Not all of them, mind, but just a few are starting to have the soft spots which tomorrow will be full-out rot. That’s the one downside of growing heirloom tomatoes that I’ve discovered, and (in my opinion) it’s the only downside: they just don’t last long, once you pick them. But I don’t care. The upsides are so numerous and delicious and delightful (honestly) that I can put up with the one little piddly thing. But it also means that they won’t wait to be used, once they’ve taken the notion to turn to the dark side. And look. Aren’t they purty? so . . . purty! As I write, I’ve canned two batches of tomatoes so far (that’s 20 quarts) with Lucille’s old-fashioned method. Amalia is as good-natured as she can be about standing in the sticky, warm kitchen with me, scalding and peeling and chunking tomatoes. My older kids: Matthew, Andrew, Bethie, and Timothy–never complained about all the preserving work this time of year, either. I’m not sure (“I’m not quitesure” is how my granddaughter Anya would say it) why, except that probably it’s a relief after all the time that we’ve spent pulling weeds lately, to just stand in one place in the kitchen and be occupied with such an easy task as peeling scalded tomatoes. And of course she can set up Pandora on the laptop and sing away to her favorite music as we work together. Amalia prefers show tunes. So you can just imagine what our kitchen is like this time of year. Sticky. Hot. Juicy. Crowded. Steamy. Tomatoey. Full of loud, exuberant singing. With a bit of help, it only takes me a couple of hours to put up a batch, and each quart is a promise of the highest-quality tomatoes this winter for soups and stews and sauces. I know where these lovely ‘maters were grown, and just how they were grown and processed. I ran out of my canned tomatoes this year in March, and my salsa at Christmastime, and I’m still smarting from the blows my children inflicted on me when they discovered that we’d have to do without for so many months 😉. I hate to buy canned tomatoes. Even the “good ones” taste too much like the can, in my opinion. Also it pains my wallet to fork out a dollar or more for just one little ole’ can of such sub prime stuff. I’ve never found any canned tomatoes that are as good as the ones I can myself. And salsa? Well, I’ll share my recipe with you as soon as I make my first batch. Later this week, probably. It’s so much more delicious than the stuff you can buy at the store. We don’t buy salsa, either, except for those odd and confusing specialty varieties that Timothy likes to try: ghost-pepper salsa. Pineapple mango salsa. Pumpkin Elderberry Salsa. That sort of thing. Last year I made habanero salsa, which met even Timothy’s approval, which was surprising because he likes things so hot. But that recipe was blazing hot, and he said he liked the taste, too. 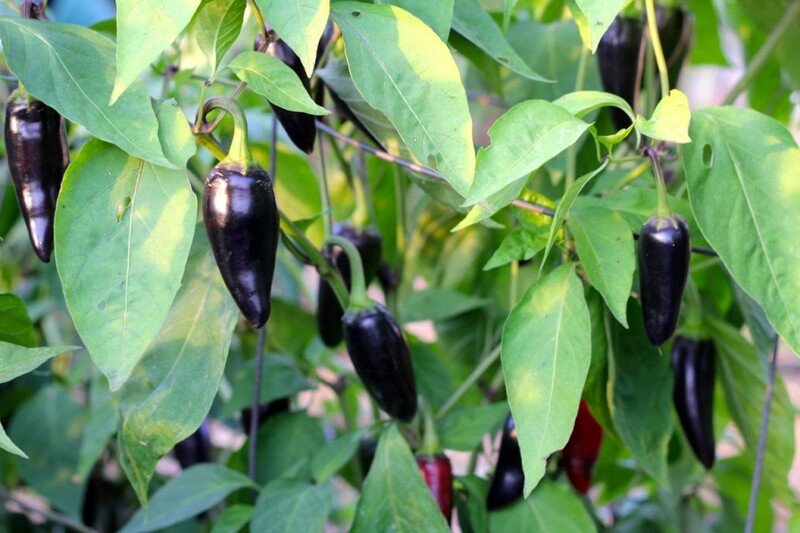 I went for purple this year, in the jalapeno department. I’ll all about pretty. But back to the fall garden. There are many great reasons to consider planting a fall garden, so if you’re on the fence on the matter, these are especially for you. Many folks don’t realize that there’s a full second gardening season which starts in our part of the country just . . . about . . . now. Putting in a fall garden can be a risky business, because you never really know when the first frost and freeze will be, though it’s usually around October 10th in our area, Zone 5. Some years it’s much, much later. I’ll never forget the year that my mom took a wild hair and put in lots and lots of acorn and butternut squash in late summer. It was really late in the summer to be planting winter squash. People would walk by and shake their heads and cluck their well-meaning tongues. “That Elna. What on earth is she thinking, putting in winter squash so late in the year–?” But we had a very late first frost date that year, and she was laughing all the way–you might say–to the bank. The Squash Bank. She harvested bushels and bushels of winter squash, which she shared with all of us, and we had the most beautiful squashes to eat all winter long. I remember helping her tote them up to the house. It was a brilliant move, almost as if she knew that there would be a late freeze that year. Probably she did. She’s always been a bit clairvoyant. Well, it might be a bit late to plant squash, but there are lots of other wonderful things that you can plant right now that will keep you eating out of your garden much longer than you might expect. Last year, we put in leeks and carrots and beets and turnips and lettuce and spinach in August, and we had great, lovely edibles in our garden until the new year. We didn’t have to start buying groceries from the store until after Christmas. I get so spoiled at being able to cook and eat most of our meals out of the garden during the summer, that it’s a difficult transition to start having to buy food again. Except for, of course, flour and sugar and butter (no cow yet) and a few other things we can’t produce (coconut milk, bananas, bacon). So have I got you thinking about what you could plant right now? Hooray! You won’t regret it. The weeds aren’t quite as quick-growing in the cooler days of fall, and many of the insect pests have moved on. And you know that you’re going to be looking for reasons to be outside, in the sparkling cool and crisp fall days to come. Besides splitting wood, of course. Of course there is a plethora of information and planting schedules and so forth online for your area, but I’ll share with you what we are planning on putting in for a fall garden, in case you need ideas. One more thing: think of a layer of protection over some of your fall garden, if you want to prolong the harvest even further. Think straw bales and old windows, or row covers, or cold frames. Many years there is one hard freeze, followed by several weeks of mild, impossibly delightful weather to follow. So if you can protect your crops from that one freeze, you can get much more from your fall garden. Fall garden. Let’s do this thing. Semi-hardy vegetables (can stand light frost, 30-32° F) such as: beets, Chinese cabbage, collards, lettuce, radishes, winter radishes (Amalia’s favorite thing to grow in the fall), spinach, Swiss chard, and green onions, and whatnot. Hardy vegetables (can stand several frosts but are killed when temperatures drop near 20° F): arugula, mache, cabbage, broccoli, cauliflower, Brussels sprouts, carrot, turnip, rutabaga and kale, and the like. If you’ve had the foresight to grow new transplants of cauliflower, broccoli, kale, cabbage, and the like, you can put those little plants in now, although you’ll have to protect them, of course, from the notorious white butterfly, the cabbage moth. I’d recommend throwing a light row cover over them, until those rascally cabbage moths get thrown off their groove by the cooler weather. Which–hopefully–will be soon! To decide when to plant your fall crops, get out your calendar and start counting backward from your normal first frost date, which is October 10th to 15th here at our place. Add together the days to harvest, which is usually printed on the seed packet and the number of days you’ll need to harvest a crop. If your plants are sensitive to cold, add in 10-14 days to protect them from early frost. Add in 10-14 days for the “fall factor”, which accounts for slowing plant growth due to shorter day length. That, by the way, is the technical information I got off of the UNL website. I’m rarely this methodical. I’ve been tearing out spent glads and sweet peas and snapdragons and cosmos from my hoop house, and as soon as I’m finished, I’ll put in two large beds of fall goodies: mustard greens, baby kale, winter radishes (so Amalia will stop hitting me with a stick), and spinach and lettuces. So I’ll have a layer of protection (the hoop house) over these crops. Out in the garden proper (no protection), Amalia and I are pulling weeds like wildwomen, and clearing out spent beds of spring-planted kohlrabi, beets, cabbages, and summer squash. In those spaces, I’ll plant the hardier vegetables: carrots, turnips, radishes (radishes take only 3 to 4 weeks to come to maturity, so I’ll get at least two more plantings of them in before I have to worry about frost) and so forth. That’s my plan. What’s yours? Here’s a tip for you: first, go over your seeds left over from the spring. Get your calendar out. Study the days-to-harvest numbers on the back, and figure how many days you have left, if you put your fall garden in within the next few days. 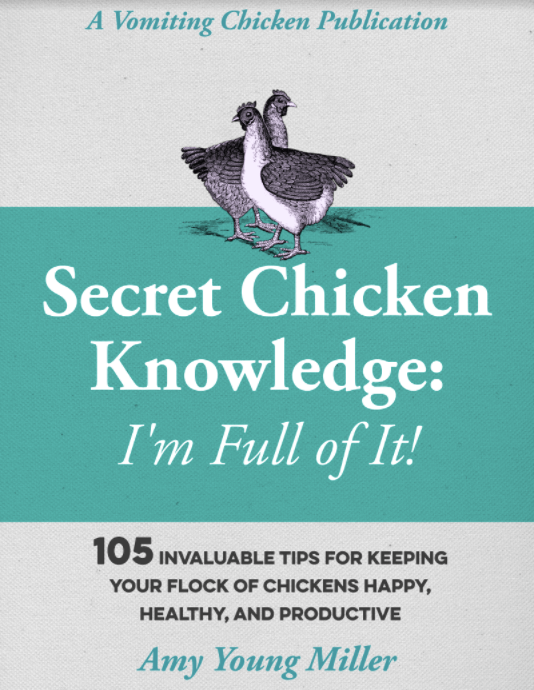 Then think about what you and your family would like to eat (no sense in growing stuff that you’re just going to throw to the chickens, anyway) and what you’ve not gotten enough of yet this summer. Then get in there and plant! 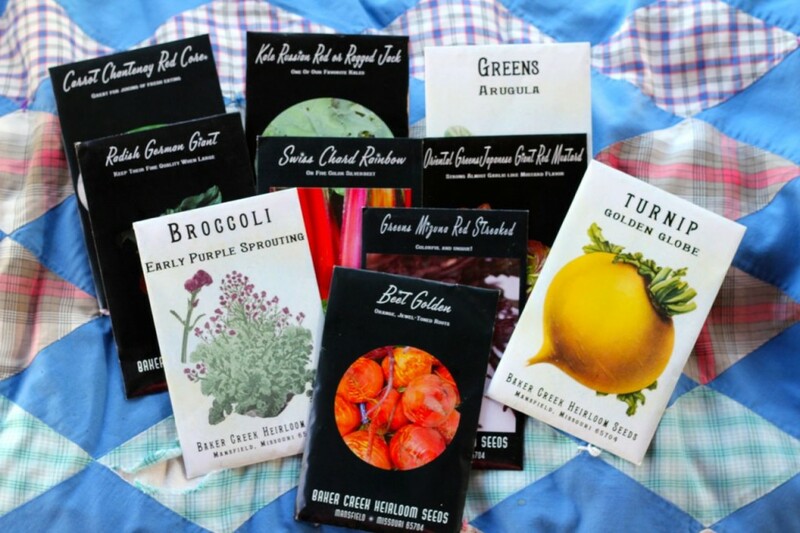 Here’s a special treat for you: I’ve put together a sweet giveaway of seeds from my own collection–some from my own garden and my seed-saving, and some from Baker Creek Heirloom Seeds–and it includes seeds that do really well in the fall, including radishes, kale (baby kale is great to have in the fall), carrots, and more. To ENTER: Here’s all you need to do: Share this post (on Facebook, Twitter, or whatever) and then leave a comment below, telling me how you shared this post, and what you are planning for your fall garden. Thanks for checking in, and for entering! I’m only running this giveaway for one week, so enter today! This Giveaway will end on Tuesday evening, September 2nd, at midnight. 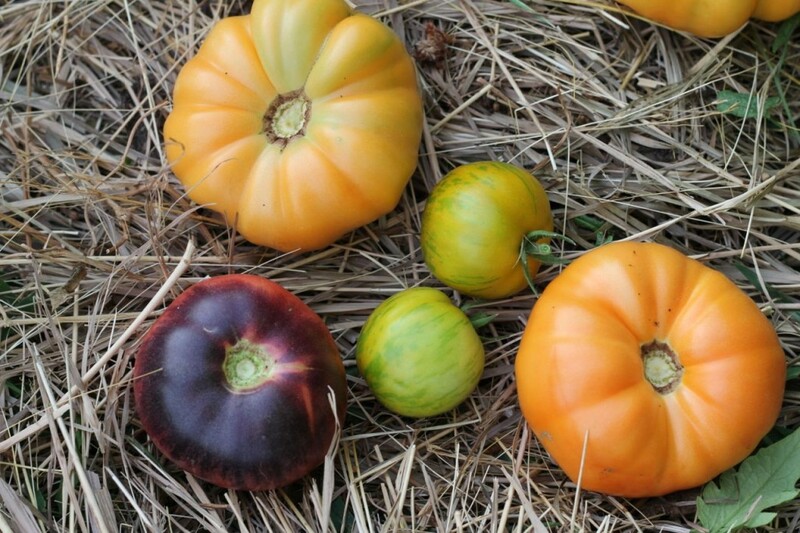 For information about fall gardening, you can check out the Baker Creek Heirloom Seeds website. Just for a teaser, look at what’s written about one variety that Baker Creek carries, Japanese Giant Red Mustard. I‘m putting some of this into my garden this week. It sounds fabulous, doesn’t it? I’ve never grown this variety of mustard before, but reading the comments about it really convinced me. So excited . . . ! I’m linking up with The Prairie Homestead Barn Hop: c’mon over and learn something new! Also I’m sharing with the Home Matters Linking Party. It’s fun! I learn so much from your blog…thank you! Thank you, Jessica! We will have to get together soon! Funny you post about gardens today as I also did. 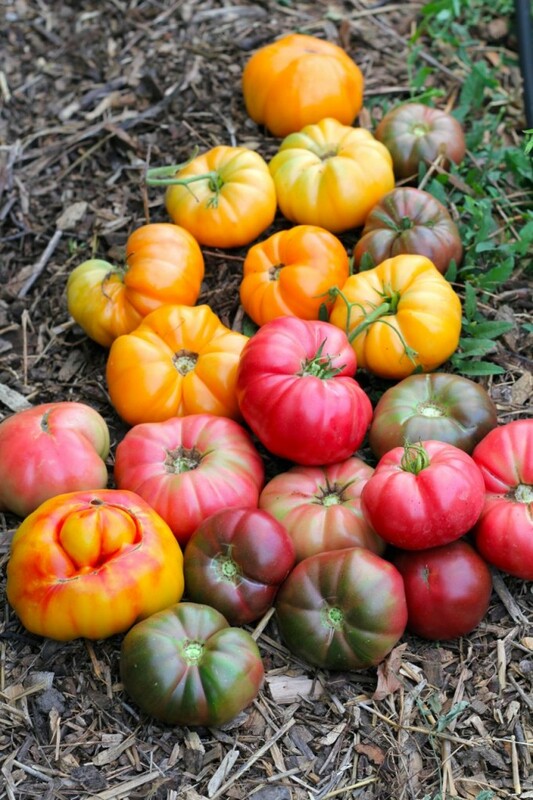 Lovely heirloom harvests and planning the fall plantings. Great giveaway too. Thank you Fran. 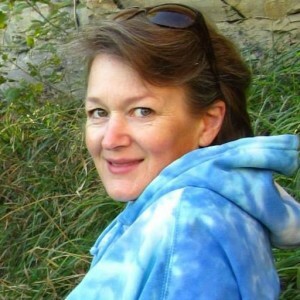 I’m going to pop over and see your blog today, too! Well, I’ve not tried a fall planting yet (this fall is the first), but peas! Spring peas are my absolute favorite, so I have high hopes for fall ones. Peas are a great idea in the fall! They like cooler weather. Wonderful blog! I absolutely love the idea of a fall garden. There is so much to learn from your blogs. Thak you so much for sharing! Tell me the story about your mom’s supernatural abilities, Amy, please. I am, actually, intensely interested!! I actually got my fall garden in 2 weeks ago. So far everything is humming right along *fingers crossed*. I was actually considering adding a few more things to it this weekend. If I can find the space! Jillian, sounds like a fun project! Thank you Sojourner! Good luck with the herb bed! I like to plant broccoli…..and hope that it survives winter and in spring I will get beautiful plants. I don’t do much fall planting, but I like to put in spinach when it gets cooler. My my, we do go on don;t we. Well I have about 100 days left before we start our “Spring” garden, so I guess we have time to do a little fall planting..It is fall isn’t it. It’s been chilly around here with showers almost daily so I think it’s fall anyway. I sure hope all those weeds are gone before the first of September. You know, before we visit your Plantation. I guess I could toss some work cloths in the back of the car……….na, I’ll let little Mac show me to the tiller…..I can handle one of those………. I wish I could plant some of those yummy tomatoes and other plants but I have to admit I have given up on my vege patch. Any time I get one going I end up letting the sheep and calf eat it as a supplement! Oh! Well, it sounds like your garden is going to good use, eh? Our favorite thing to plant in our garden in the fall? Hard to say. Have had variable luck with peas. We’ve had more success with lettuce. Our community garden ends in October so we would actually have more success if we were able to plant at home- here in New York, once, my husband got cauliflower to last to Thanksgiving. Sometimes cauliflower and broccoli plants can really get a second wind in the fall. Last year, because I was just overbusy, I never did pull the broccoli and cauliflower plants that I harvested from in the spring. They were kinda lost in the weeds. Then in the fall, what do you know–I discovered them covered with new growth!! I harvested the most beautiful cauliflower EVER that fall, from the spring plants. Then this year I forgot to plant cauliflower. Wow! i just placed an order yesterday, but can always use more seeds from Baker’s Creek! Loved your tomato canning saga! Oh, Amy, I’ve got some major tomato envy. (Thou shalt not covet, thou shalt not covet, thou shalt not covet….) Your tomatoes are gorgeous! Because of your blog you’ve inspired me to plant only heirloom plants next year and then henceforth. And I’ve got my nice, new raised garden bed my husband built me (I shared the pic with you on facebook the other day) to fill up with such loveliness! I am one excited girl. I loved this post on fall gardening, it’s a project I’ve been wanting to do.– I’ve learned so much from your blog! How do you make room in your garden from your summer veggies to plant for fall? I’m thinking of yanking out my zucchini and maybe some of my uber-prolific cucumbers in order to plant some fall veggies. I’m thinking carrots and maybe kale. Anyway, thanks again for the beautiful post. Hooray! I don’t think you’ll regret changing over to heirlooms, Katie! The “Conventional Wisdom” says to also plant a few hybrids, just in case the heirlooms fall prey to diseases but honestly I’ve never had a problem with it. I don’t plant my tomato plants in the same spot year after year, though. Be sure to get the Baker Creek Heirloom Seeds Catalog, Katie, and you’ll be drooling over those pictures until next spring! To answer your question: I make room by yanking out anything that is finished (beets are mature, so I’ll pull them) or that I’m just tired of (I’ve been neglecting the zucchini plants and they are buggy, anyhow). Give yourself permission if something is frustrating you (those kohlrabis didn’t bulb out the way they should have, AND we are tired of eating them anyway) to just pull it out. Add a bit of compost (oops I should have added that to the post) and plant! Have fun! Carrots and kale should be great, AND you can plant the kale close together for baby kale. You might not have time to grow it to full size, but baby kale leaves are awesome in salads and stirfries. Happy gardening! The idea of a fall garden sounds interesting. I love the crop of tomatoes from your garden and the purple jalapenos as well. It’s one last Final Hurrah! from the garden, Dee! One last curtsey to summertime and all the fruitfulness it brings! Such beautiful veggies! I love Baker Creek…I actually found a pkg of their Black Krim tomato seed in some old seed we had..it was dated 2008. Planted them all , got 30 some plants up, lost a few and struggled to find space in our garden. Finally managed to raise over 20 and they have beautiful green tomatoes on them, some beginning to blush… can’t wait to eat them! Black Krim are some of my favorites. I just love the really dark tomatoes. I think they have such a rich flavor. That’s amazing that those seeds are still good after all these years! It sounds like you’ll have plenty of tomatoes this fall! Yum! I have never planted a fall garden, but I am eager to give it a try! Do, Marguerite, do give it a try! Even just putting in a few radish and lettuce seeds is easy and quick! Thanks for the ideas on those annoying cabbage moths !! They’ve destroyed by kale !! Good luck! They are a formidable foe! I haven’t done a Fall garden…would love to try…maybe next year! My favorite thing to plant is lettuce. I love my salads. Since you get cold weather quicker than Texas, you are ready to start planting. It is still hot, hot, hot – our hottest month is August – so I am in the planning stages of a winter garden. Almost every year since I have begun gardening at this particular location, I have spent my falls preparing and recovering from foot/ankle surgeries. This year I can actually plant a winter garden and take care of it myself. It is a FIRST! Yippee. I think Bakers Creek has the best catalog ever, and wonderful seeds besides. I have purchased from a lot of different places, but they have the greatest variety. My fun plant this year is the Jelly Melons. What a novelty they are. It generates a lot of conversations, to be sure. 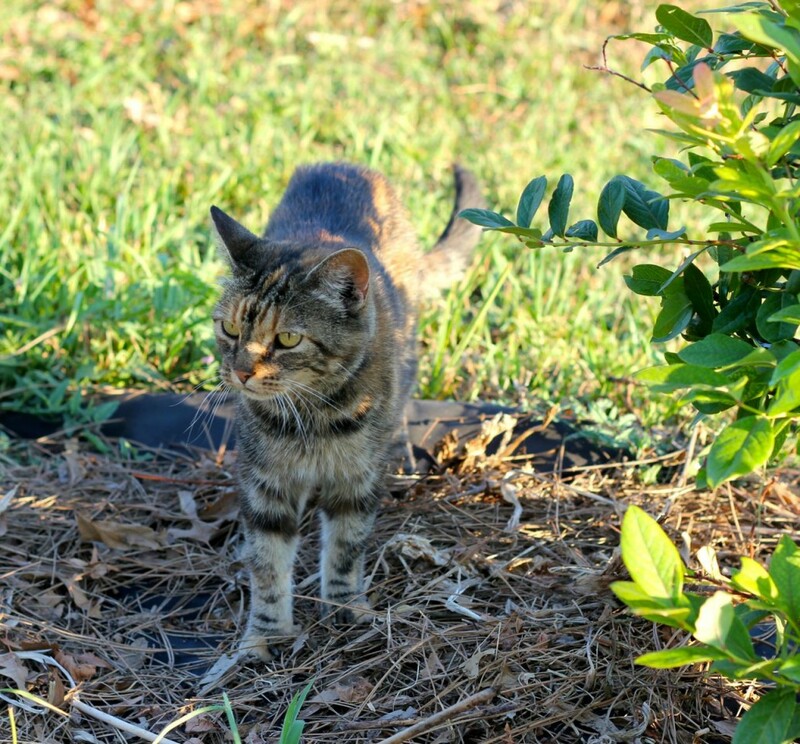 Thanks for all the fun pictures of your tomatoes, peppers and of course, the kitty! I love to see others who grow heirloom stuff like I do. I can’t wait to get your salsa recipe! Do you make it with fresh tomatoes, or tomatoes that you have frozen? I pop a lot of my tomatoes into the freezer, then pull them to make up sauces and stuff. I wonder if they would work for salsa? I would like to can up some for winter. Yummmmm! Hi Amy, I meant to tell you yesterday that the link to Baker in your rafflecopter doesn’t work. I went back today and it still didn’t work. I ended up registering manually. Don’t know if it’s me or if there really is a problem with the link. You-know-who in NY, who still hasn’t planted the borage. Perhaps I should write a post called “why I haven’t planted Amy’s borage yet”: maybe in September. THanks Alana. I think it’s fixed now. I’m looking forward to that post! Going to put my first Fall Garden in. I am mainly looking forward to Spinach, Broccoli and Beets. Hopefully this week-end I can get it all in. Also plan on putting Garlic in this fall (Also a first). Love your site Amy. Thanks Lesa. I hope you have a very fruitful fall garden! I love my fall garden! Can’t wait to keep checking the progress through the next few months. There’s something so special about a fall garden, isn’t there, Kelly? more fresh produce. Thank you for offering the seed giveaway. Only heirlooms go into my garden, so I can use all the help I can get in acquiring seeds. It would be very helpful to have the seeds for next fall’s garden in advance to help streamline the garden planning that will need to be done this winter. I love to plant a second round of peas in late summer so I can enjoy them in early fall. Plus carrots and beets and of course pumpkins! I just made my first Baker Creek seeds order and I’m so excited! Have you heard of the Seed Guy, Amy? (www.theseedguy.com) That’s another place I like to buy heirloom and organic seeds. I hadn’t heard of the Seed Guy yet, but I’m going to check him out. THanks for the suggestion! My pleasure! I’ve enjoyed the seeds I’ve gotten from him thus far. I’ve never thought about a fall garden but it’s never too late to try someghing new! The nice thing I’ve found about gardening in the fall, Diane, is that everything comes up so quickly. I planted radishes and turnips and the seeds germinated in 2-3 days! Thanks Kristen! I enjoyed linking up with you ladies! I’ll try to remember to pop by on Wednesday! We are going to plant turnips and garlic. Perfect time to grow both! I shared the link on my facebook page and I’m hoping that some of my friends will try to win seeds also. For the fall we plan on planting sweet potatoes and some greens. We are still in the learning process of planting in GA. clay. Had some successes and failures this summer with our garden. But love growing my own food. It makes you feel good. Sweet potatoes! I’ve never tried growing them here in NE for a fall garden. Did you know that the leaves are edible? I’d imagine that your growing season is much longer than ours. Blessings! What a great post! I shared via Facebook. This year, our winter garden will have anew addition, Brussels sprouts! I’m excited to try this for the first time. We’ll also have some kale, cabbage, and root veggies. So excited, and thanks for sharing this post with us!! Thank you, Kaurie, for entering! Best of luck to you! Okay Lance! 🙂 Best of luck to you! Thanks Dana! I hope it goes well for you! Hi, I tweeted this page at https://twitter.com/happymaxgirl/status/504578376833564672. I wasn’t successful at fall gardening last year, my very first year trying. I do well in summer. I am not one to give up so I am trying a fast-growing broccoli, beets, swiss chard, kale and lettuce. I hope I get it down this year :). Well, Rochelle, I hope you get it down this year, too! The best thing to do is just to keep working at it! You’ll always have some success and some failure! I shared on Facebook, Twitter, and Pinterest! We have planned a fairly aggressive fall garden for us. We are relative newbies to gardening, but we have broccoli and cauliflower, beets, lettuce, and cabbages planned, oh, and some garlic to over winter and maybe onions and potatoes. of course, just started green beans and pees again! This year I hope to actually USE that pressure canner I got last year, but have been too frightened to try out yet! Wow, that is an impressive array of fall crops. Now I hope for you a nice long cool fall to enjoy them all! I hope you get the nerve to try out the pressure canner, too! There are lots of tutorials online. I’d watch a few of them until you feel less frightened of it! oh I forgot to add, I shared on facebook! I shared this post on Facebook – For my fall garden I have planted carrots, beets, started cole crops, and will plant a variety of lettuce and other greens. Thanks so much for sharing, Caroline! I hope your fall garden is wonderfully productive! I shared the post on Facebook. I never seem to plant enough, or get a good enough harvest, of my Spring planting of peas (and this year was SOOOO wet). A guy at the Farmer’s Market used to have the BEST Fall peas…might be time to try it myself! That’s a terrific idea! Fall peas sound really sweet! Stolen?? You mean stolen by people? (Not squirrels or bunnies?) That’s awful! just saw your comments on BakersCreek Heirloom Seeds, which is my favorite seed company. I’m planting my first ever fall garden and am looking forward to lettuce and collards and kale, etc and will be watching you for additional information, as well. Today’s fall planting in Tennessee- lettuce and kale. Tomorrow parsnips and swiss chard. Running alittle late but hopefully ok! Great post. It’s my second year doing a fall garden. I’m going to try beets carrots turnips chard and onions. Love bakers creek seeds. Posted the link on Pinterest. I’ve not been able to give your blog the time it deserves the past several weeks and won’t be able to this week either so I am going to skip the giveaway. Our garden has been neglected and we must be out of our community garden by the last week of October, anyway. I just wanted to say “thank you” and I hope whoever wins has a grand time with your seeds. Thanks Alana. It is just so good to hear from you. I know how busy you are! Enjoy your fall gardening clean-up!